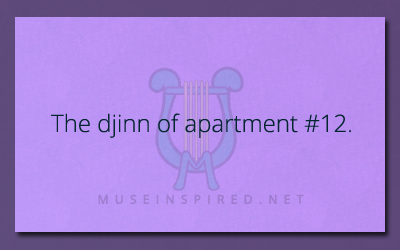 Djinn - What's the story behind the Djinn in Apartment 12? What’s The Story? – The Djinn of Apartment #12. There is a djinn in apartment number twelve. Nothing is normal when a genie is next door. If you’re not sure what a “djinn” is, that is one of the alternate names for a Genie. When you hear the word genie, most people will probably think about Disney’s Aladdin. Which is pretty cool – you can’t go wrong with Robin Williams! The classic djinn tropes often include magic lamps and the granting of wishes, along with the warning that you should never trust a genie. They are prominent in Arabic and Islamic mythology and according to the wikipedia page on Jinn they are one of the three “sapient beings of God” along with humans and angels. I thought that was a very neat and very muse enticing tidbit. What's the story? - A gold coin at the end of a rainbow.